74 F A ll 2018 Practice l ink.com features When it comes to the negotiation itself, both Van Camp and Frugé say they like working directly with candidates when they can. Though Frugé sometimes works with candidates' attorneys and reviews contracts with attorney edits, she generally prefers to communicate directly with the candidates. Frugé says candidates often email her questions or ask questions about their contracts via conference call. She adds that she never minds if a candidate asks lots of questions about the contract, saying it's "better to be thorough and understand everything upfront rather than be surprised by something after the deal is done." In fact, she appreciates when candidates s h o w t h o r o u g h n e s s a n d attention to detail. Van Camp advises physicians to do the negotiation themselves. 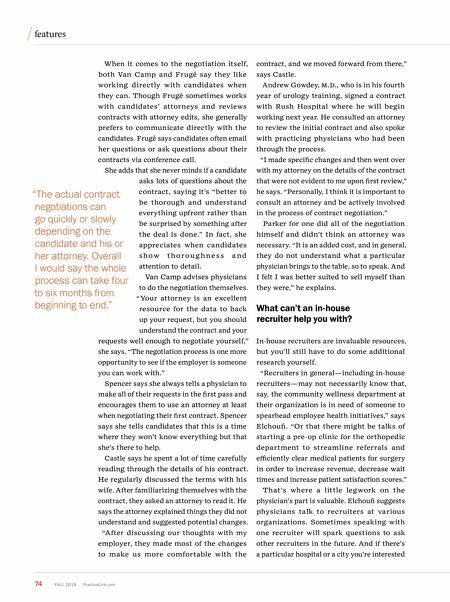 "Your attorney is an excellent resource for the data to back up your request, but you should understand the contract and your requests well enough to negotiate yourself," she says. "The negotiation process is one more opportunity to see if the employer is someone you can work with." Spencer says she always tells a physician to make all of their requests in the first pass and encourages them to use an attorney at least when negotiating their first contract. Spencer says she tells candidates that this is a time where they won't know everything but that she's there to help. Castle says he spent a lot of time carefully reading through the details of his contract. He regularly discussed the terms with his wife. After familiarizing themselves with the contract, they asked an attorney to read it. He says the attorney explained things they did not understand and suggested potential changes. "After discussing our thoughts with my employer, they made most of the changes to make us more comfortable with the contract, and we moved forward from there," says Castle. Andrew Gowdey, M.D., who is in his fourth year of urology training, signed a contract with Rush Hospital where he will begin working next year. He consulted an attorney to review the initial contract and also spoke with practicing physicians who had been through the process. "I made specific changes and then went over with my attorney on the details of the contract that were not evident to me upon first review," he says. "Personally, I think it is important to consult an attorney and be actively involved in the process of contract negotiation." Parker for one did all of the negotiation himself and didn't think an attorney was necessary. "It is an added cost, and in general, they do not understand what a particular physician brings to the table, so to speak. And I felt I was better suited to sell myself than they were," he explains. What can't an in ‑ house recruiter help you with? In-house recruiters are invaluable resources, but you'll still have to do some additional research yourself. "Recruiters in general — including in-house recruiters — may not necessarily know that, say, the community wellness department at their organization is in need of someone to spearhead employee health initiatives," says Elchoufi. 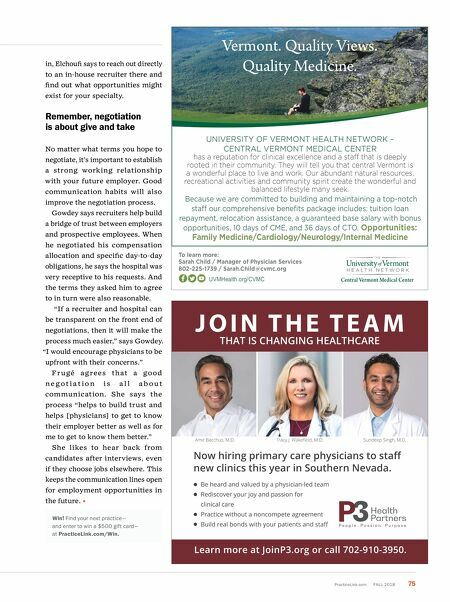 "Or that there might be talks of starting a pre-op clinic for the orthopedic department to streamline referrals and efficiently clear medical patients for surgery in order to increase revenue, decrease wait times and increase patient satisfaction scores." That's where a little legwork on the physician's part is valuable. Elchoufi suggests physicians talk to recruiters at various organizations. Sometimes speaking with one recruiter will spark questions to ask other recruiters in the future. And if there's a particular hospital or a city you're interested "The actual contract negotiations can go quickly or slowly depending on the candidate and his or her attorney. Overall I would say the whole process can take four to six months from beginning to end."